Assassins is a 1995 American action thriller film directed and produced by Richard Donner, written by Andy and Larry Wachowski and also rewritten by Brian Helgeland. 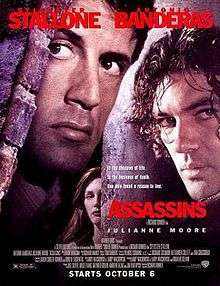 The film stars Sylvester Stallone, Antonio Banderas and Julianne Moore. The Wachowskis stated that their script was "totally rewritten" by Helgeland, and that they tried to remove their names from the film but failed. As Rath tries to figure out who sent Bain, the contractor offers him one last job that could financially allow him to retire: killing a computer hacker named Electra (Julianne Moore) and the four Dutch buyers of a disk that contains sensitive information and Rath has to retrieve. However, Electra has set up cameras in all the rooms of the apartment block where she lives and watches them like watching television. Bain first kills the four Dutch buyers who turn out to be Interpol agents, but when Rath comes to kill Electra, for the first time he has a change of heart. His pay for the job is given to him in a briefcase in exchange for the disk. But the briefcase actually contains a bomb placed by his own contractor in an attempt to kill him. Luckily, Electra had swapped the disk, not sure if Rath was coming back or not. The contractor takes the chance and hires Bain to terminate him; now having become a target along with Electra he must try and extract enough money out of his contractor so he can disappear for good, while avoiding the bloodthirsty Bain. Rath's contractor turns out to be none other than Nicolai himself who also hired Bain to track down Electra and the disk. Nicolai revealed he had a vest on when Rath shot him years ago and faked his death ever since. Knowing that Nicolai would kill him too, Bain, along with Rath, shot him dead. Bain plans to kill Rath to be the number one assassin. But Electra puts on her sunglasses to allow Rath to see Bain. Rath shot Bain through his jacket killing him. The original spec screenplay was written by Larry and Andy Wachowski and sold for $1 million to producer Joel Silver around the same time he bought their script for The Matrix, also for $1 million. The script was similar to the final product, but with a more developed love story between Rath and Electra and a briefer ending without the character of Nicolai. Joel Silver offered Richard Donner $10 million to direct, but Donner insisted the script be rewritten to tone down the violence and make the central character more sympathetic and brought in Brian Helgeland, who did a page one rewrite and earned a co-screenwriter credit. The Wachowskis attempted to remove their name from the film but were refused by the Writers Guild of America. The film received mostly negative press, and currently holds a 16% rating on Rotten Tomatoes based on 45 reviews, with an average rating of 3.7/10. The script was heavily criticized for being confusing and dull. However, the actors' performances were praised. Stallone's performance in the film earned him a Golden Raspberry Award nomination for Worst Actor (also for Judge Dredd), but lost the trophy to Pauly Shore for Jury Duty. Assassins debuted at No. 2 at the box office. The film grossed $30.3 million in the US and another $53.2 million worldwide, for a total of $83.5 million. ↑ "ASSASSINS (15)". British Board of Film Classification. 1995-10-02. Retrieved 2012-01-03. 1 2 3 "Assassins". Box Office Mojo. Retrieved 2015-07-22. ↑ Archived July 25, 2012, at the Wayback Machine. ↑ "Beyond the Matrix". The New Yorker. 2012-09-10. Retrieved 2014-07-28. ↑ Horowitz, Josh (2003-11-05). "The Lost Wachowski Brothers Interview". Archived from the original on 2003-12-02. Retrieved 2015-07-22. ↑ Wilmington, Michael (1995-10-06). "Bad Guys Win, Viewers Lose In `Assassins'". Chicago Tribune. Retrieved 2010-10-01. ↑ Maslin, Janet (1995-10-06). "FILM REVIEW; The Gunplay When Killers Compete". The New York Times. Retrieved 2010-10-01. ↑ "Assassins". Rotten Tomatoes. Retrieved 2014-07-28. ↑ Dutka, Elaine (1995-10-10). "'Seven' Holds Onto Its First-Place Spot". The Los Angeles Times. Retrieved 2010-11-13.